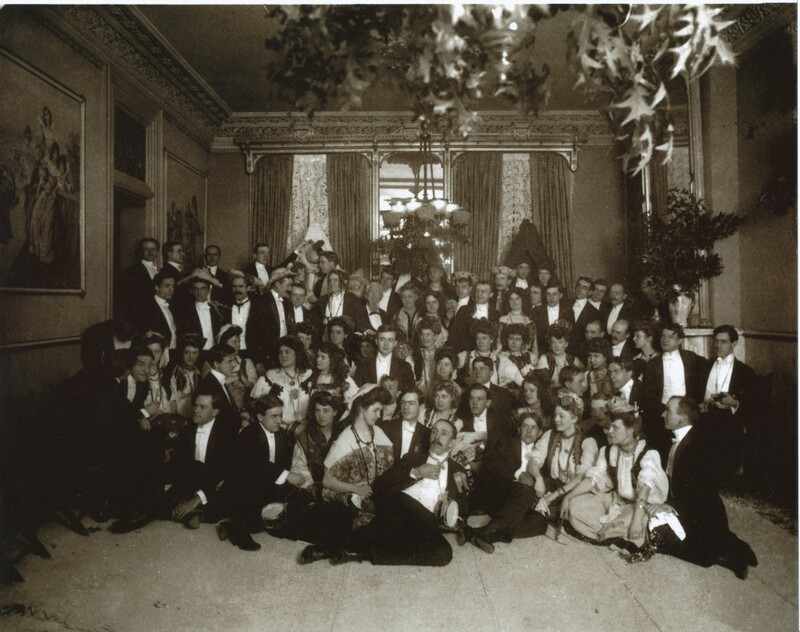 James and Rowena are at the center of this picture taken perhaps in the late 1890’s or early 1900’s surrounded by young people dressed in Gypsy garb. James died in early 1905. On the back of this picture is written “Gypsy Cotillion Rowena Lee.” This picture was taken in the parlor of the James Lee House 690 Adams Ave. Memphis TN. This picture was actually taken in their home at 690 Adams Ave (in the parlor). This is extremely exciting to see what the room looked like when they lived in it! Jose, I was given this picture by an elderly lady whose mother is one of the young women in this picture. The origional was somewhat faded and had several areas missing small parts of the picture. A commercial artist friend used PhotoShop to repair and sharpen the origional. Thank you for clarifing the location of this picture. I will update my description of the picture. I would love to meet you and your wife and see the inside of the house. Jose, I am not sure if this was in the James Lee house. My uncle Bayliss thought the picture was taken possibly in the 1900 Century Club. The Library of Congress has a file detailing architecural pictures and drawings created in the early 1970’s when work was being done nationwide to place old buildings in the National Historic Register. Finding this set of files at the Library of Congress is not difficult. Good luck with your plans to convert my great great grandparents home to profitable use. First, I want to thank you for putting together this important resource about your family’s life and impact in the Memphis community–you have much to be proud of! Second, I greatly appreciate your (and your brother’s) well wishes as my wife and I embark in this exciting project of restoring the James Lee House to its original state. I would love to have the opportunity to show you around the house if you’re interested (it’s somewhat of a mess right now, but still quite a site). In terms of the picture, I’ve posted some current pictures on a facebook (The James Lee House) and you can see a current picture of the parlor–there’s no doubt about it, your picture was taken there. We have, as you suggested, accessed the information on the house from the Library of Congress–we are very lucky to have all that information about the house! I hope to have the honor of meeting you soon! Again, thank you! Mark, thank you for your interest in leelinesteamers.com. Rowena was the daughter of Peters Lee. first cousin, however, I never remember meeting her as a child.